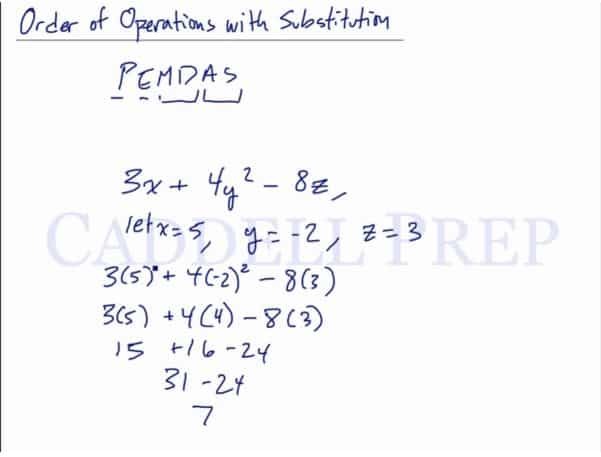 In this video, we will be learning how to use the order of operations (PEMDAS) in word problems involving substitution. Let’s go over the order of operations with substitution. We all know that it is PEMDAS. In order to evaluate this, we have to substitute these values using parenthesis. Let’s solve the exponent part first. Now, our answer is . So the key is to substitute using parenthesis. Then follow the rules in PEMDAS.